My husband is a mad Cleveland Browns fan! ...I guess this means I'll have more time to devote to designing appliques for the next few months. This is my NFL Football machine embroidery applique design. Perfect for that NFL sports fan in your life! Looks great on a t-shirt...what about on a baby's bib! There is even room for you to personalize this design with their name…or their team’s name! This appliqué design is a delight to sew out. It features decorative ladder stitching oversewn with triple-bean stitching to give the ball a realistic look. Have fun using different thread color and fabric color combinations too. Use brown tones like I have for that good old fashioned leather ball we had as kids. Enjoy! 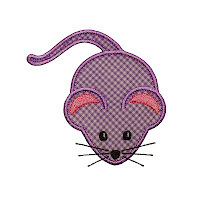 This sweet little mouse is a delight to sew out. 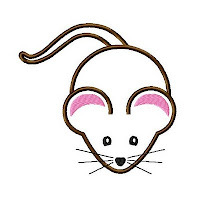 It’s the sort of mouse you wouldn’t mind finding in your kitchen. …well, maybe just appliquéd onto something for your kitchen. It features a gorgeous stitch of Triple-Bean against the Satin Stitch edge which gives your appliqué a quality look. 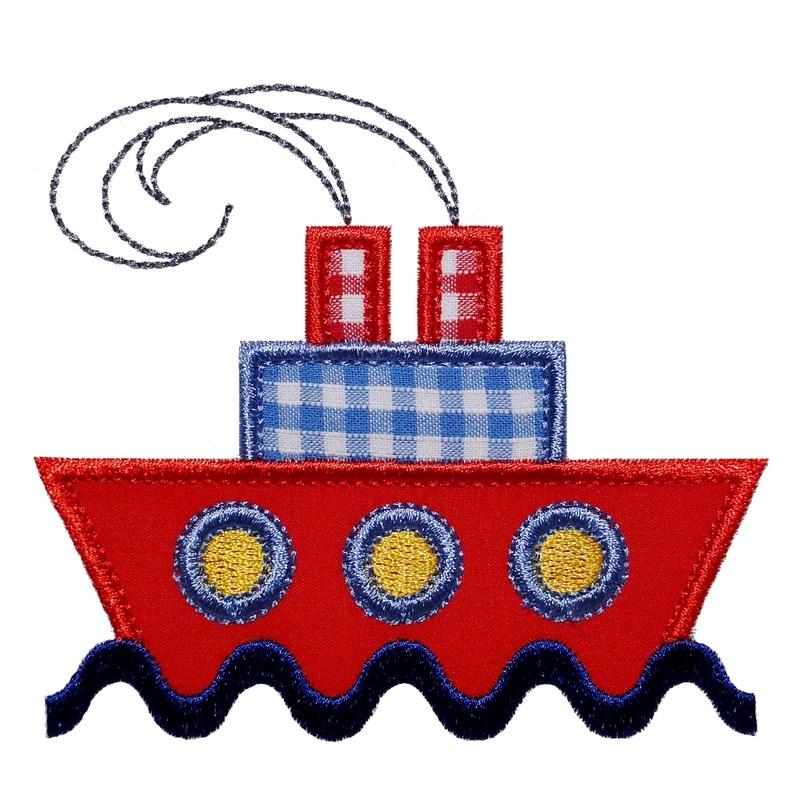 The animated sew out shows you just how quick and easy this applique is to do. 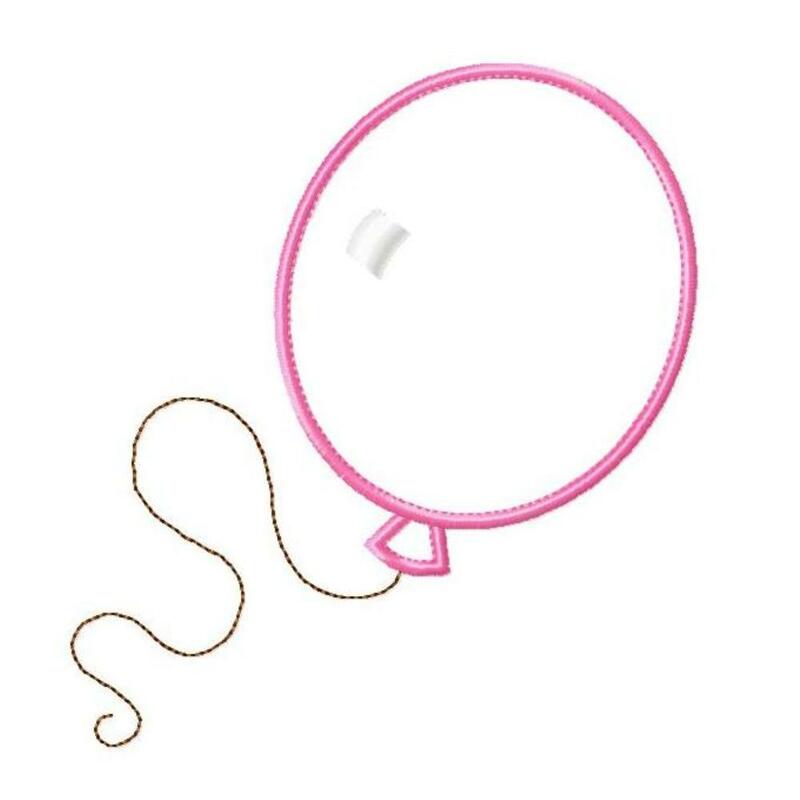 PARTY BALLOON...perfect for a special birthday boy or girl! What is it about balloons that make people happy? My little one arrived home from a visit to the shops with Dad and proudly showed me a new aquisition - a bright blue balloon filled with helium. "Don't let go of the string, Mom! ", I was sternly warned. Not only is this appliqué design a quick and easy way to jazz up your child's clothing, it is great fun for birthday boys and birthday girls – there’s plenty of room for you to add a numeral too. 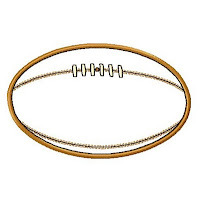 It features a Triple-Bean stitched string and comes complete with SHINE spot. There’s bound to be some fabric in your stash perfect for this project! 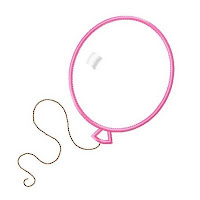 Have fun using different thread color and fabric color combinations with PARTY BALLOON and you will be rewarded a vast array different looks. Enjoy! 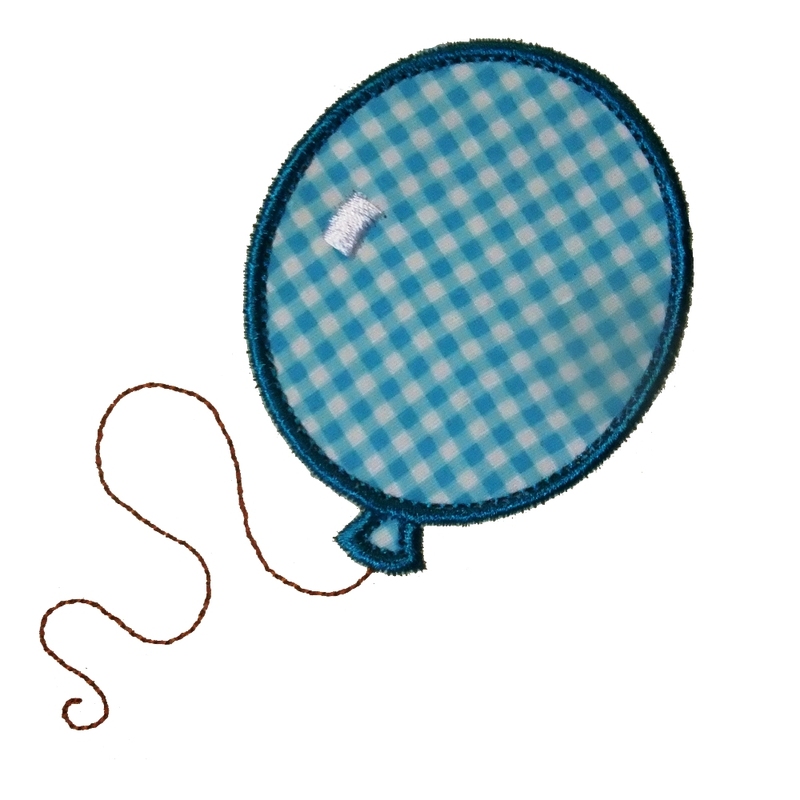 - PARTY BALLOON in 3 sizes in the file format of your choice. You can find this new applique design at my Etsy shop. Thinking about a recent holiday inspired me to design this applique. The weather was warm - blissfully warmer than Melbourne - and the constant light breeze made for perfect kite flying conditions. 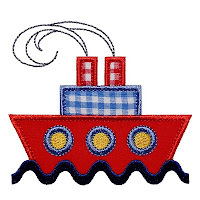 This appliqué design is great fun for boys AND for girls. With 4 appliqué areas, you can pretty this kite up as much as you wish. Featuring Double-Diamond stitch for the cross pieces to beautifully hide your fabric joins and a Triple-Bean stitched tail complete with Satin Stitch ties. There’s bound to be some fabric in your stash perfect for this project! Have fun using different thread color and fabric color combinations with FLY A KITE and you will be rewarded a vast array different looks. Enjoy! 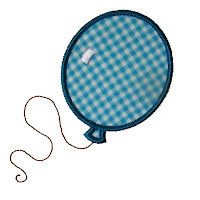 FLY A KITE in 4 sizes in the for file format of your choice. Easy to follow step-by-step instructions – Simply cut as you sew! A perfect applique design for the little man in your life! It looks brilliant on a plain t-shirt. For a quick and very effective way to decorate a little boy's room, sew it out and staple it around a small canvas frame. Voila! Instant art! This design is a delight to sew out and features a rippling Ric Rac ocean and Triple Bean stitched smoke swirling from the funnels. Have fun using different thread color and fabric color combinations with and you will be rewarded with a vast array of different looks. 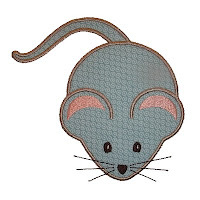 4x4 Hoop - exact size 3.9" x 3.43"
5x7 Hoop - exact sizes 4.9" x 4.16" and 5.84" x 4.87"
The animated sew out shows you just how quick and easy it is to recreate this fun applique for a special little boy you know. 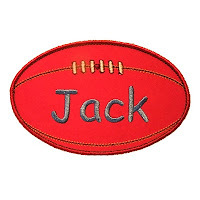 Here is a perfect appliqué for that Aussie sports fan in your life - an Australian Rules Football. This looks great on a t-shirt! There is even room for you to personalize this design with a name…or with the name of a favorite football team! 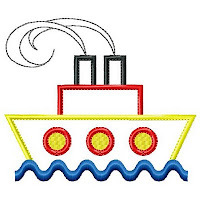 This applique design is a delight to sew out. It features decorative ladder stitching oversewn with triple-bean stitching to give the ball a realistic look. Have fun using different thread colour and fabric colour combinations too. 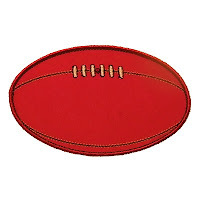 Red fabric with red satin edge stitch for the AFL Sherrin ball or use brown tones for that good old fashioned brown leather ball we kicked around the backyard when we were kids. 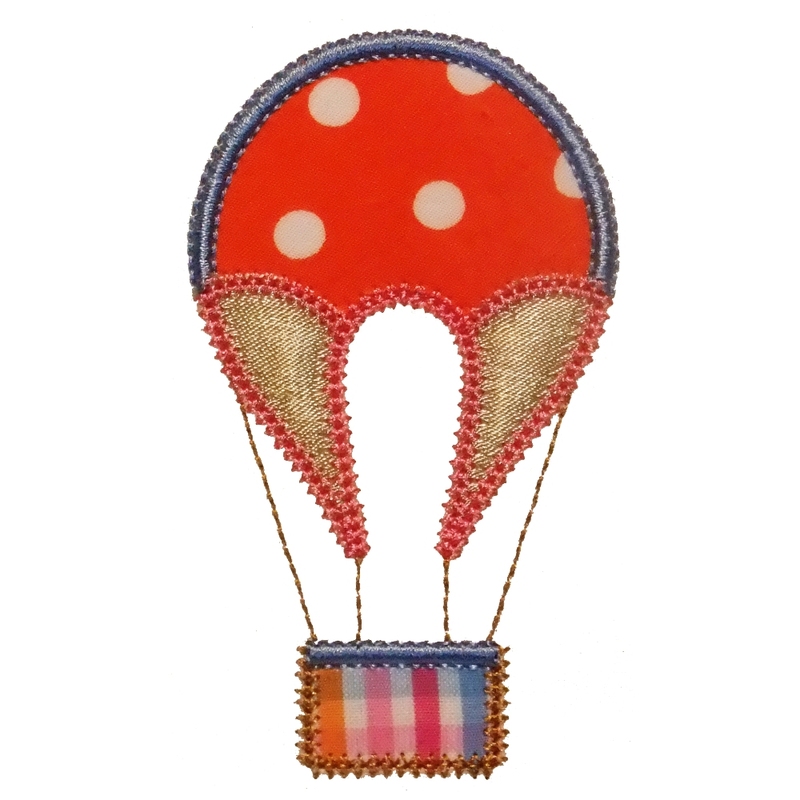 Up, up and away...this HOT AIR BALLOON is a fun appliqué for Boys AND for Girls! This design beautifully integrates Double-Diamond stitch with Satin Stitch to give the balloon’s basket a woven cane look. The Double-Diamond stitch on the base of the balloon gives the balloon canopy a rich decorative texture. I loved it when my little one was in a pram - I really enjoyed our time out walking. 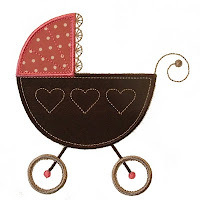 I do admit in hindsight that I had a small obsession with prams - at one stage I had four. My favorite being an old navy blue and silver Emmaljunga. This applique design is the quintessential pram - timeless, classic, stylish. Sew it out on a t-shirt as a gift for a Mom-to-be or on a nappy bag. Sew it out and glue it to some blank card for a unique gift card. It's available in 3 sizes.